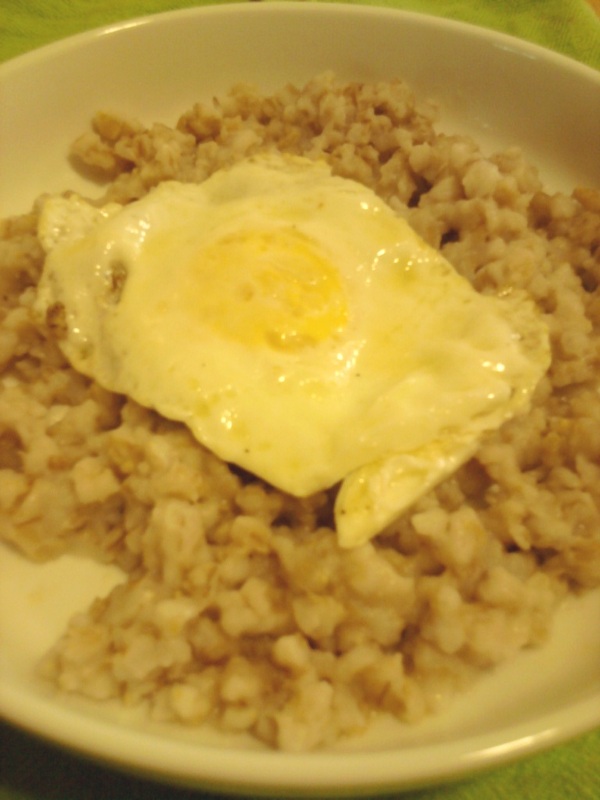 For a breakfast high in protein and fiber, throw a fried egg on some boiled barley and enjoy the yumminess! By itself, boiled barley has a hearty grain taste. I like to cook it for a long time, stirring frequently (and occasionally adding extra water) so that the barley is soft and tender and the starch water thickens to a yummy consistency. Add a bit of salt while cooking. A bowl of this plain barley as a porridge can be a terrific alternative to oatmeal. Or, for extra protein and variety, throw a fried egg on top. It makes for a great-tasting, super healthy breakfast. By the way, in my experience, barley always takes longer to fully cook than the package indicates, so allow for extra boiling time. The other day, I mixed boiled pearled barley with choclo cut off the cob. (Peruvian corn; for image and other uses, see this recipe). I boiled both separately first, then mixed them together and boiled them for an additional 30 minutes with some butter and salt (stirring every few minutes). The resulting side dish was one of the yummiest things I’ve made in a while. The texture of the corn perfectly complimented the barley. The taste of the extra soft barley with the potato-like corn and butter blended so well! I took some over to Vita’s apartment and we gobbled it all up. We started calling it kasha, which she taught me is a Russian word for a savory, hearty side dish like this turned out to be. I always cook enough dinner so that there are leftovers for lunch the next day. Sometimes there’s even more than that so I try to get creative and use the leftovers in new ways so that we’re not eating the same thing for three or four days in a row. For example, back in April, I made a giant batch of pea soup. There is still one small container of it in the freezer. Once defrosted, it will be enough for one big lunch or two small sides for dinner. However, I’ve also got some plain boiled barley left in the fridge, which can be an excellent ingredient in soup. So, I’m going to combine the leftover soup and the barley as a base for a stew. I haven’t made a final decision yet, but I plan to add some carrots and maybe also some choclo. It’ll be one of the heartiest vegetable stews I’ve ever made. We also have some leftover pulled pork roast, which could be added since the soup was originally ham stock-based, but I’m not sure about that yet. 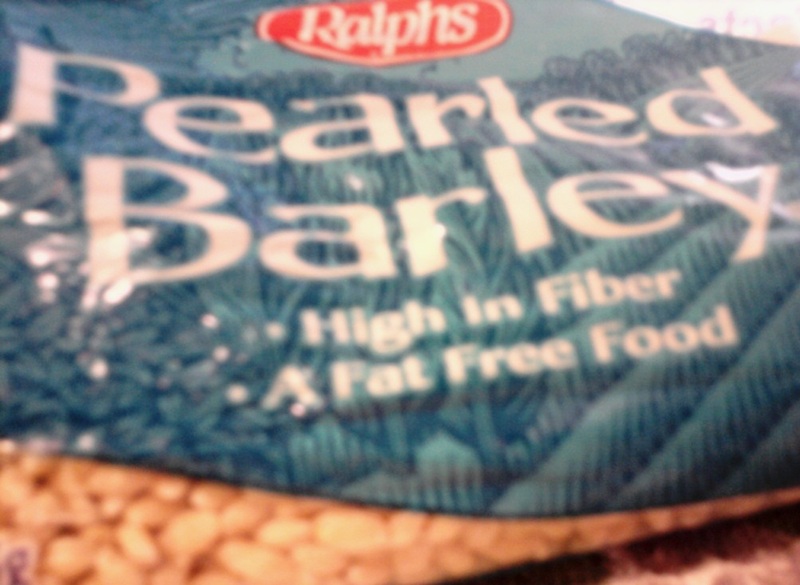 Barley is a great source of fiber and amino acids. This tasty grain can be used in many types of hot and cold dishes. There are so many other ways to cook barley. I even saw some recipes for salads that mix barley with soybeans and other veggies, which sounds really yummy. For a salad, I would stop cooking the barley once it reached a sort of “al dente” texture so that it would blend well with other cold veggies because you wouldn’t want mushy barley in a salad. 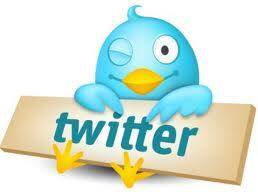 I hope you enjoy trying it out in new ways in your life! Healthy snack recipes often require some creative substitutions to suit personal preferences. Reader's Digest May issue screen capture. 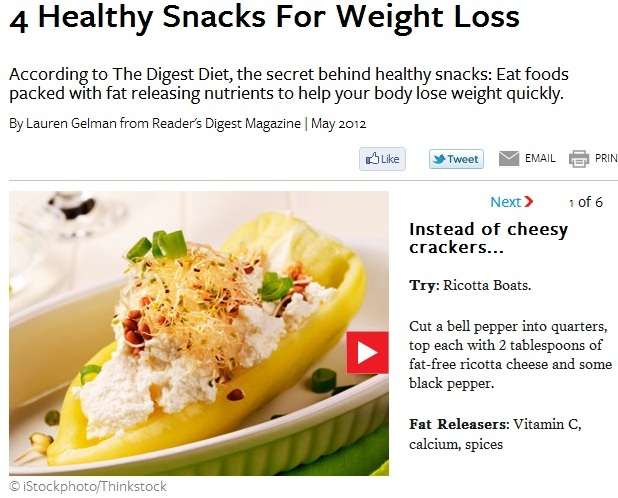 I enjoy reading articles about healthy recipes and snack ideas but I don’t always like eating them. Most “healthy” food recipes I come across contain ingredients that I just can’t stomach. Cottage cheese? No, thank you! Asparagus? It better be cooked in a ton of butter and salt so that it’s not bitter. I’m not being picky to be difficult; we just all have our personal tastes. Unfortunately, much of that personal taste runs counter to most healthy eating recommendations. I find myself needing to get creative in the kitchen to make things that are both healthy and appealing to me (for example, Leftover Easter Ham Recipe #2: Ham & Pepper Jack Quesadillas).